Getting married at Stanford University was meant to be. The two had met there while Alexis was studying law and Ryan was studying medicine. They picked a sunny spring day in May, and got ready at the nearby Garden Court Hotel in downtown Palo Alto. Alexis’ beautiful beaded vintage-style Jenny Packham dress hung silkily while she had her make-up and finished. The finishing touch was a sparkling clip for her hair; given to the bride from her mother. Alexis also carried that day a special family heirloom, a handkerchief from her mother-in-law’s side of the family. I always look for a special location for First Looks, and a little anticipation goes a long way! Alexis descended the grand staircase while Ryan waited below. The two strolled through Stanford’s distinctive sandstone arches, and lush courtyards. Stanford’s campus is such a beautiful setting for photos, and will also be a place the two can visit and remember both their university days and their wedding! The magenta and peach hues from the flowers designed by Willow Magnolia, were the absolute perfect pops of color to compliment their wedding day! On their way to sign their ketubah! The ketubah is a Jewish marriage contract, and it was a really special gathering of their closest family who were their to witness as the rabbi lead the ceremony and signing. Stanford has a couple of wedding venues, one is the Memorial Church. 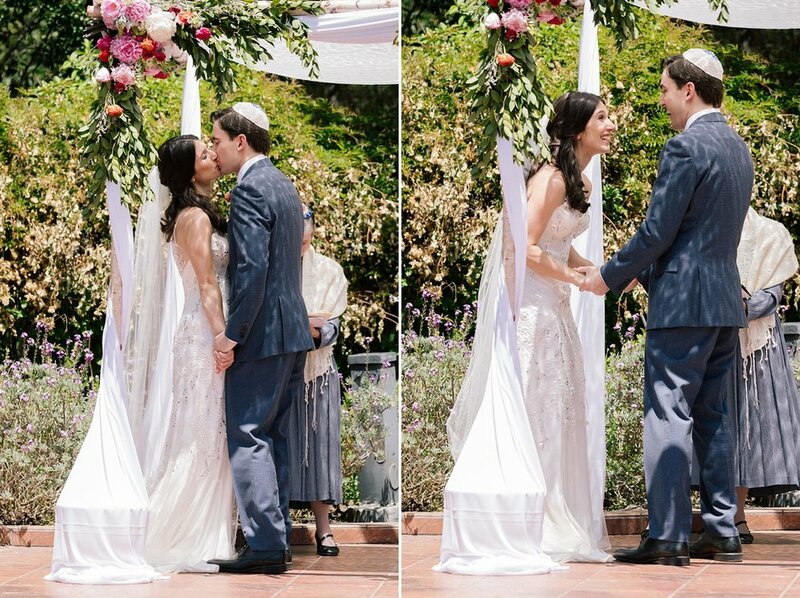 These two chose to get married at the Stanford Faculty Club courtyard, under a beautiful chuppah. This chuppah also happened to be the same one under which their close friends were married earlier that year! That feeling when you realize that you’ve just married your best friend! Some bloody marys to kick off the festivities? Yes please! There is nothing like the hora, a traditional Jewish dance, to get everyone out of their seats and on the dance floor! Alexis gave some great advice for couples who are planning their wedding. The day really does fly by fast, and you want to soak in all those great moments as much as you can! “My advice is probably cliche but to try and slow down to enjoy every moment of the wedding weekend and to invite family to come to the destination as early as a week before (assuming that is helpful to you and not stressful) since you don’t necessarily get to spend as much quality time as you’d like with everyone on the day of. Would also suggest springing for a videographer (or asking a friend to film) during any important speeches. Also, if within your budget, wedding guests really appreciate being invited to the welcome/rehearsal dinner too. Mazel Tov to Ryan and Alexis, and happy anniversary! Thinking about getting married at Stanford University? Contact Sonya for photography questions!.